The second day of the conference was well attended and went well. It started with an early opening ceremony, graced by the President of the National University of Singapore Prof. Tan Chor Chuan, as well as Mdm. 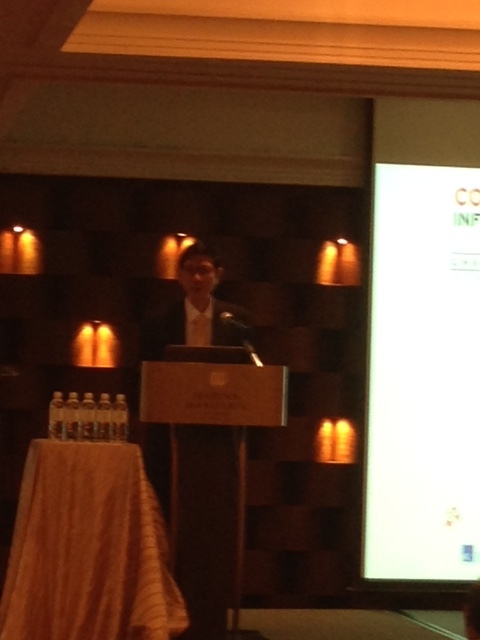 Kay Kuok, who is the chair of the Board of Trustees of the Courage Fund (the main sponsor of the conference). I have to apologise in advance for the poor quality of the iPhone 5 photos in dim light. 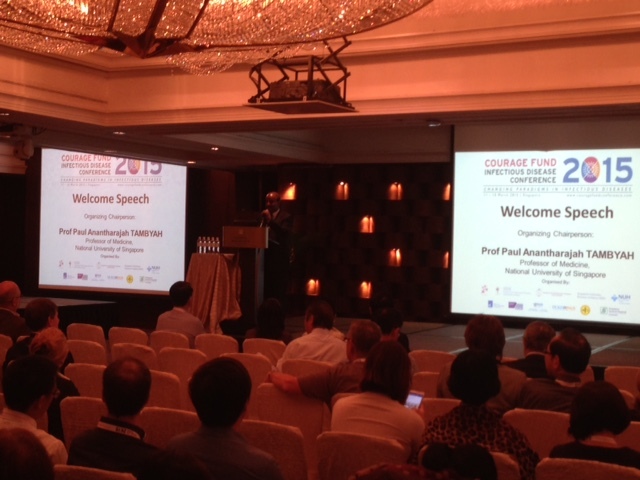 Welcome speech at the opening ceremony of the Courage Fund ID Conference, delivered by Prof. Paul Tambyah, the organising chair of the conference. A panoramic view of the opening ceremony. Prof. Tan Chor Chuan, President of NUS and Guest of Honour at the opening ceremony, giving a speech. The keynote lecture was delivered by Prof. Malik Peiris, who is Chair Professor of Microbiology and Tam Wah-Ching Professor of Medical Sciences at the University of Hong Kong (he has his own Wikipedia page!). 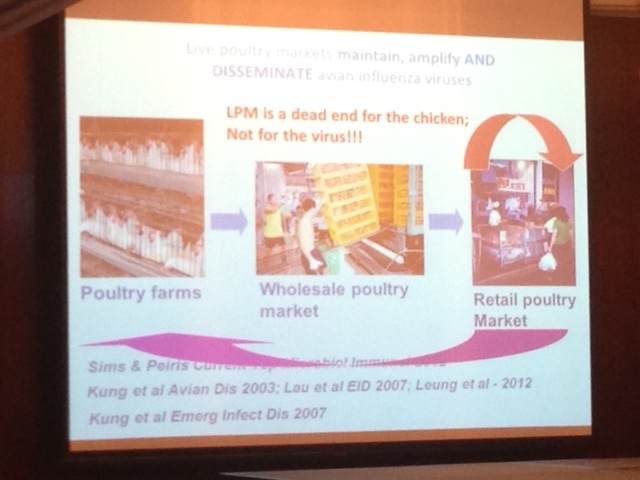 A slide from Prof. Malik Peiris’ talk – live poultry markets in China and the spread of influenza from chickens to other chickens and humans. I had the opportunity to chair the session on Genomics and Bacterial Infections. The speakers were energetic, inspired and gave great talks. 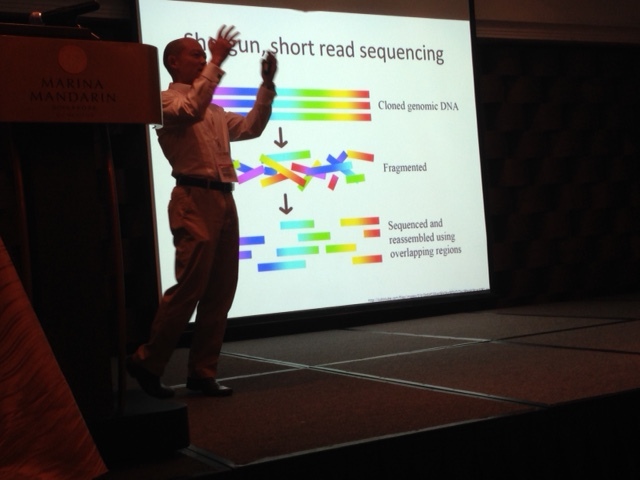 The final discussion on the practical role (and limitations) of next generation sequencing (NGS) in clinical microbiology and public health was thought-provoking and interesting. I think the integration of NGS into clinical care and epidemiological or outbreak investigations is inevitable in the near future, and should be embraced, but it is important to implement it well – there are numerous pitfalls and problems that will arise if this is done poorly. Dr. Swaine Chen from GIS giving a tutorial on NGS. 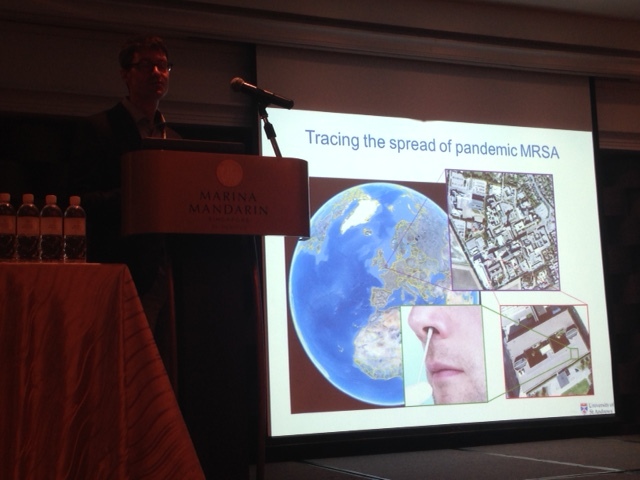 Prof Matthew Holden from the University of St. Andrews, Scotland, describing the role of NGS in archaeological and epidemiological investigations of MRSA. 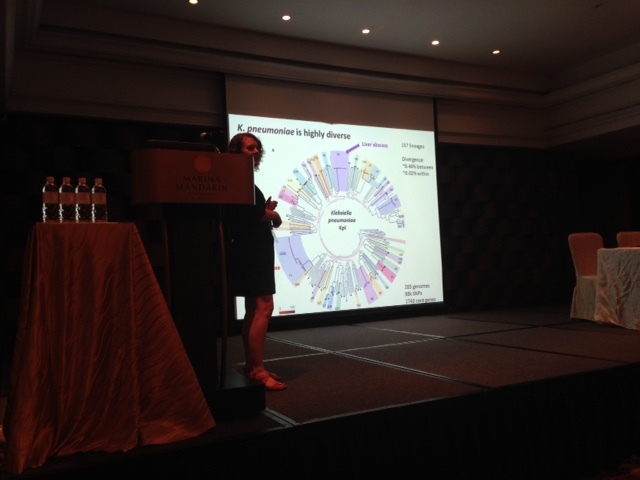 Dr. Kathryn Holt from the University of Melbourne discussing her work on the global structure of Klebsiella pneumoniae. 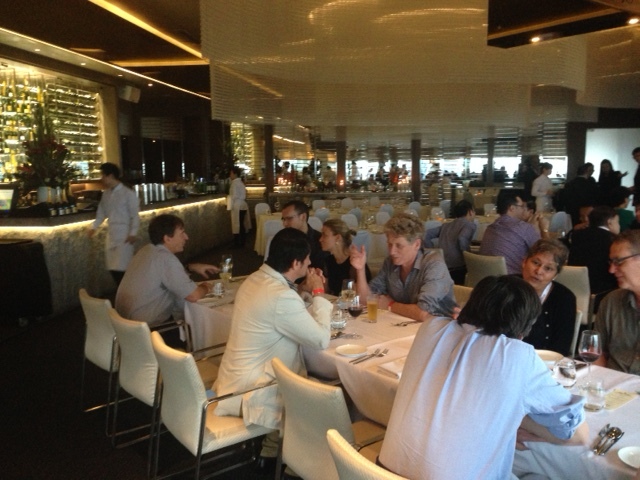 The day attended with a faculty dinner at 1-Altitude – located on the 62nd floor of One Raffles, with a magnificent view of the bay. Conference speakers and committee members at 1-Altitude. The dinner was graced by the Dean of the School of Medicine, NUS.